Fishermen are taking part in a day of protests against what they say is an "abject betrayal" over Brexit. Protesters are gathering in Plymouth, Whitstable, Hastings, Portsmouth, Milford Haven and Newcastle. Fishermen say promises of immediate control over UK waters on leaving the EU next year have been dropped. The Department for Environment, Food and Rural Affairs said it recognised disappointment but a transition deal was "safeguarding fishing communities". 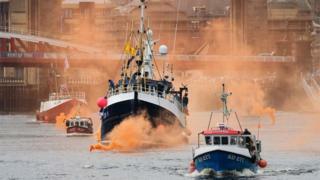 The fishing industry had wanted the UK to regain full control over the country's fishing waters on Brexit day, 29 March 2019. Instead the deal will see the UK "consulted" on quotas, with the situation remaining largely unchanged until 2021. Pro-Brexit group Fishing for Leave said the vote to leave the EU had provided a "golden opportunity" to "rejuvenate our coastal communities and industry". But fishermen were "sickened and enraged" that the government had "capitulated". About 200 boats are thought to have taken part in the protest, including 60 in Plymouth, Fishing for Leave said. What is the Brexit implementation period? Spokesman Aaron Brown said the transitional arrangement would allow the EU to "enforce detrimental legislation and cull what is left of the British industry". He said: "We are really staring down the barrel of a gun with this transition deal." Andrew Rowe, who was on Plymouth Hoe supporting the fishermen, said his engineering business relied on a thriving fishing industry. "If they get stopped from fishing I will lose my business maintaining the fishing fleet in Plymouth," he said. "It's not only me, but my suppliers as well. "So leaving the EU with a bad deal on fishing is very serious for us." Plymouth Labour MP Luke Pollard said: "Promises were made during the Brexit referendum, and since, about what would happen to fishing after we leave the EU. "Many of those promises have turned out to be complete and utter fiction." A Defra spokesperson said it had negotiated that the UK's share of catch could not be reduced over the transition period, which was about "delivering a smooth and orderly Brexit". "It is now important we focus on the significant prize at the end of the implementation period: the arrangements will only apply to negotiations in 2019 - by December 2020 we will be negotiating fishing opportunities as an independent coastal state completely outside the Common Fisheries Policy," said Defra. "This means that for the first time in over 40 years, we will be able to decide who can access our waters and on what terms."